In every class of animals, there are species that push the limits of what their genetic family can do. The peregrine falcon can dive at speeds of up to 200mph. Cheetahs can run up to 70 mph. Insects also have an exceptional species within their ranks, the hawk moth. The hawk moth can fly 12mph at top speed, faster than many birds. For a long time, scientists did not know the mechanics of how many insects flew. 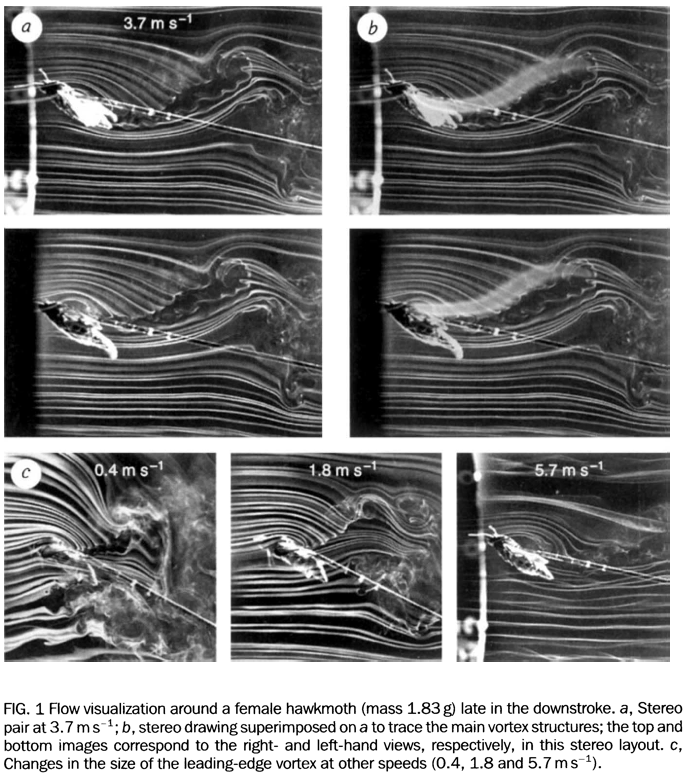 Researchers studied many different insects in wind tunnels, and they were presented with a challenging problem. Many of the insects they studied had lift coefficients that were far too high to be explained by the current theory of insect flight, which considered insect’s wings much like airplane propellers.A breakthrough came when Charlie Ellington, a researcher at Cambridge, researched the hawk moth. 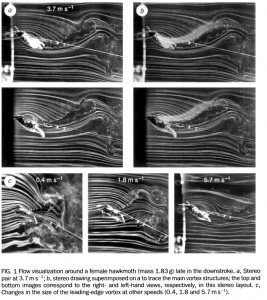 He studied the moth in a wind tunnel with smoke lines, and saw that the wings motion created a spiral leading edge vortex, depressurizing air above the wing to provide additional lift. The hawk moths wingspan is approximately 12 cm in length, large enough to allow them to fly at speeds of up to 5 m/s. It is one of only four species that has evolved the ability to hover, which it how it feeds on flowers blossoms with a tongue that can be up to 30 cm long. 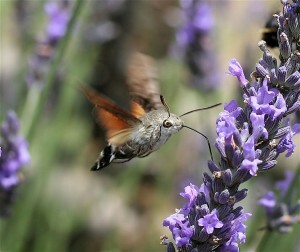 The hawk moth feeds very often to give it enough energy to hover and fly at high speeds. It also has the ability to twist its body in the air and is a very agile flyer, able to position move quickly blossom to blossom hovering and feeding. 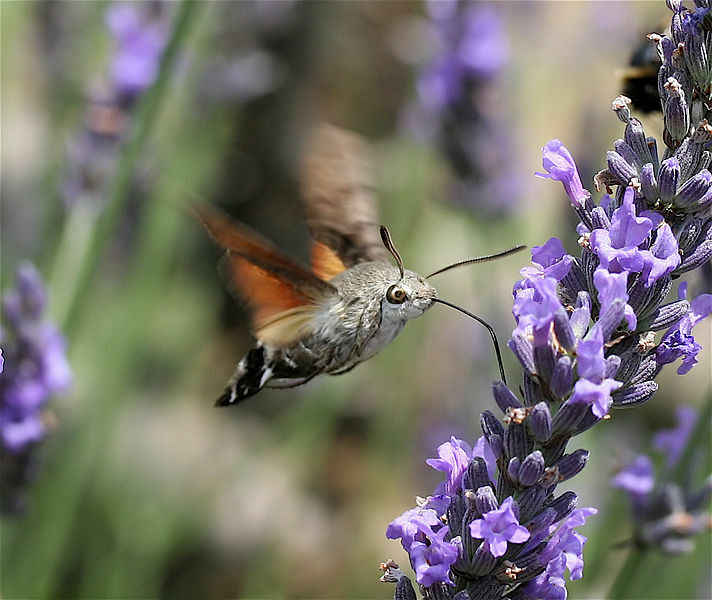 The hawk moth is the flying tanker of the insect world. Big, fast, and always refueling, yet it still retains the typical agility of smaller insects. This super-insect is a remarkable creature that redefined the limits of insects and helped scientists learn the mechanics of insect flight. You say that it is one of only four species that evolved the capacity to hover … I am left wondering, which are the other three?